A stormwater runoff area extending into Green Lake from the corner of Lake and Illinois streets had become an eyesore and with pipes that emptied directly into the lake, a potential pollution hazard. The intent was to revitalize this small strip of land into an ecologically and resident-friendly park for use by any and all of the community’s citizens, but particularly for those without direct access to the lake. Kunkel Engineering Group worked cooperatively with the City, the Park and Recreation Department and high school students to plan and design the park and to initiate a plan for reducing the release of potential pollutants into the lake. Students installed charcoal filters in the storm water inlets at street level in an effort to filter pollutants from the runoff before it reached the lake, and Kunkel Engineering, with input from the City and the Park & Recreation Department, designed the park. Completed, the park provides a gently sloping walkway that meanders through prairie grass and wild flowers toward the lake, ending at a concrete and stone overlook. 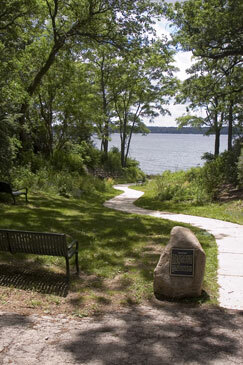 Several benches were strategically placed along the walkway and on the overlook for residents to use in enjoying the park and the lake.